Trinity Designs: It's Never Too Early! Since I'm getting ready to host my Stampin' Fools party group tonight in the studio, I was gonna do that anyway, but the rain just makes it easier to not be distracted, know what I mean? Today's card is the one I designed to go with my class last Saturday - Springtime Vintage Flower Pins. The ladies loved it and I thought well, I'd best share it with you too! It's never too early to start thinking about Mother's Day so that's what I made this card for. You could easily switch out the greeting though for a birthday or Thinking of You. I love cards that have different folds - but not too complicated, I don't have the patience for them! LOL! I started this one with a folded half sheet of Very Vanilla Cardstock. The top edge was punched with the Eyelet Border Punch, scored at about 1 1/4" in from the punched edge and folded back on itself so the lacy edge lays on the front. Clear as mud? Ok! Next, I cut a piece of Springtime Vintage DSP for the front flap - 4" x 2 1/4" and adhered it with Tombow Multi Adhesive. I'm really getting to like that adhesive for assembling my cards. It was also used to glue down the folded flap. 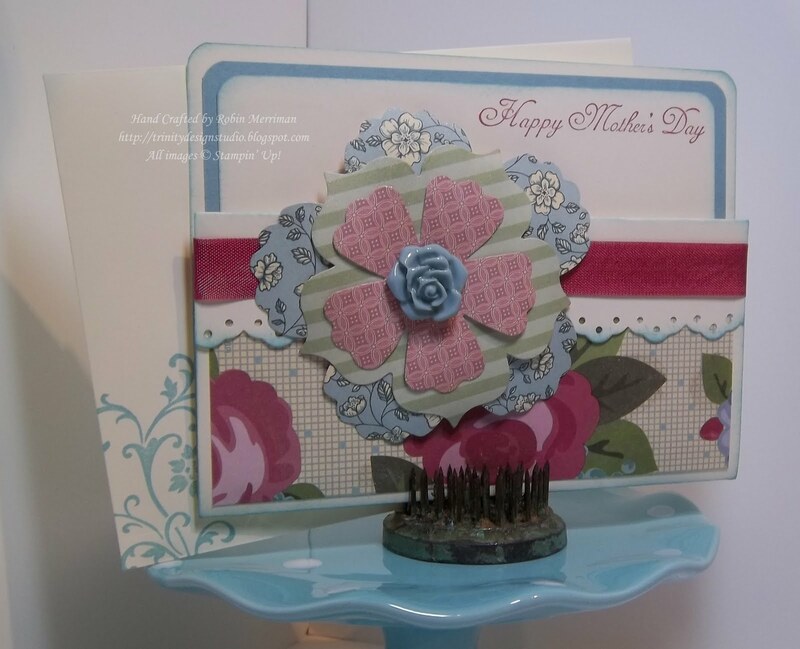 I then rounded the back corners of the card base and sponged every edge with Baja Breeze ink. For the flower on the front, I simply cut 3 pieces of the DSP (3 1/2", 3" and 2 1/2" squares) and ran them through the Big Shot with my Fun flowers Die. Each flower was curled with my Bone Folder then I attached them all together with a brad. 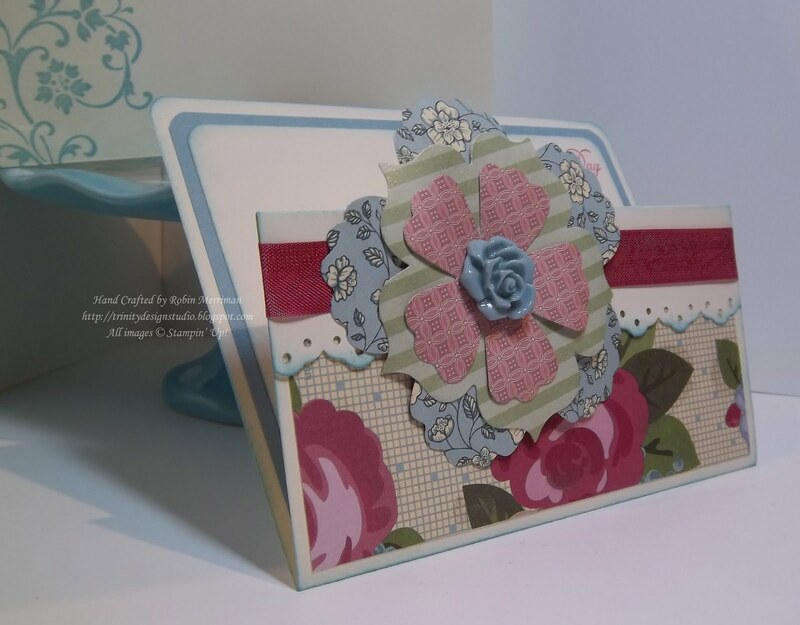 The flower was attached to the card front with Stampin' Dimensionals and I added the Baja Breeze Flower Adornment with Mini Glue Dots. The inside was simple - Baja Breeze cardstock (4" x 5 1/4") layered with Very Vanilla cardstock (3 3/4" x 5") top corners rounded on each and adhered to the inside. I used my Something To Celebrate hostess stamp set for the greeting and stamped it in Rose Red ink on the top right. The last little touch is impossible to see in these photos - I used a Sponge Dauber and dabbed on a little Champagne Mist Shimmer Paint. It's on the cut flower and I also painted it on the DSP across the front in strategic places. It adds just the right amount of gleam to this card! So, there you have it! A sweet, springy card for a dreary day! I hope it makes you smile big! As always, if you simply must have the supplies you need to recreate this project or any other on my blog, it's easy to visit my Stampin' Up! Website and shop in my Online Store! Just click HERE to go to the website and click the Shop Now Button on the top right to have the entire Stampin' Up! catalog (and more) at your fingertips! Yep! It's still Sale-A-Bration so you still earn FREE products for each $50 you spend! Even the Clearance Rack items count towards your Sale-A-Bration purchase! Have fun picking out your FREE stamps! Very pretty card. I love how you used the vintage flower adornments in the middle of the flower.